The Yarniad: Vintage-Inspired Baseball Knits - Blog Tour & Giveaway! Vintage-Inspired Baseball Knits - Blog Tour & Giveaway! In case you missed it last week, Allyson Dykhuizen of Sweatshop of Love (and curator of Holla Knits) released a new e-book collection with Knit Picks entitled Vintage-Inspired Baseball Knits. 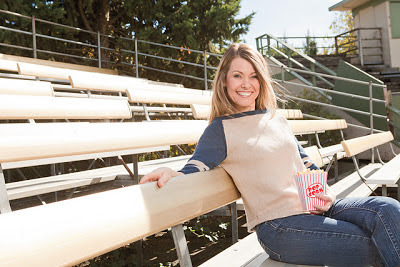 As you may or may not know, I am a huge baseball fan, a lover of all things vintage and historical, and (obviously) a knitter -- so I was thrilled when Allyson asked me to be part of its blog tour. And I also kind of want to be her best friend. Vintage-Inspired Baseball Knits is a collection of six patterns that, you might guess, are inspired by baseball history - pulling directly from its styles as well as its players. Each piece has a well thought-out background story, and I encourage you to visit the Ravelry pages linked below to read Allyson's fantastic write-ups. 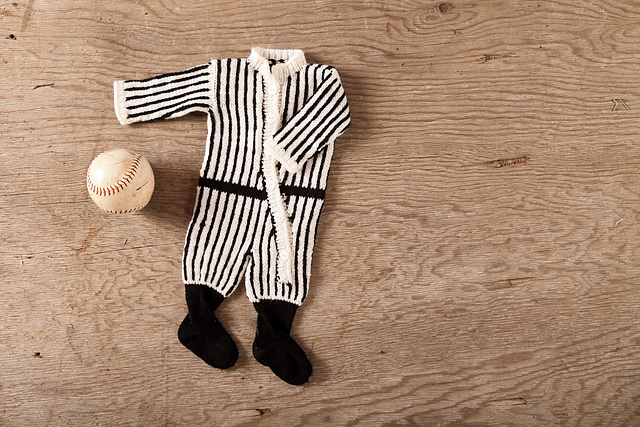 And the designs themselves are great -- incredibly fun, spring-and-summery pieces, four of which are garments that are sporty and feminine at the same time, a team-themed blanket for taking to the ballpark, and the CUTEST baby outfit (Just wait. It is SO FREAKING CUTE.) I love the pattern photos, too...the model looks like she's having so much fun! You can find the whole collection on Ravelry as well as on Knit Picks, where you can purchase it in e-book form for $9.99 and as individual patterns for $4.99 each. Allyson has even charted up 16 different vintage team logos, which you can download for free and use to personalize your knits. Here are the knits (and, again, you should really visit their Ravelry pages to read more). The Georgia Peach, inspired by Ty Cobb and the sweaters players wore a century ago. 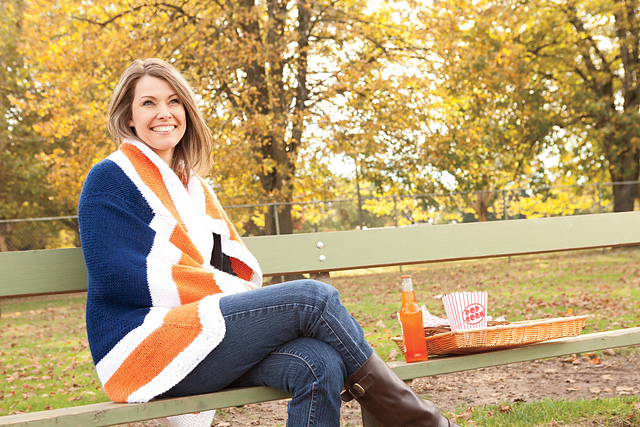 Stadium Blanket, which I need to make before baseball season starts, because AT&T park is freezing 100% of the time. This will be perfect! Harnett Tank, celebrating women in baseball - woot! Knickerbocker Tee, an adorable, feminine take on the baseball tee. and Baby Babe Ruth, perhaps the cutest thing I have ever seen IN MY ENTIRE LIFE. Now here's the really exciting part -- Allyson has offered to send a pattern of the winner's choosing to one lucky reader of The Yarniad! To enter, please leave a comment here by next Wednesday (March 6th) Friday, March 1st at 11:59pm Pacific time letting me know: 1) which pattern you'd choose, 2) if you have a favorite baseball team, and 3) a way to contact you should you win (e.g. Ravelry ID, blog address if you have an email address linked there somewhere, etc.). I'll draw a winner and let you know on Thursday. Again, you can find the whole collection on Knit Picks here and Ravelry here. And here's the full blog tour schedule -- be sure to check out the upcoming stops for more chances to win! I think I would choose the Trolley Dodger as the pattern I would likely knit first. My favorite teams are the Pittsburgh Pirates (where I grew up) and the Philadelphia Phillies (where I live now). Even though I am pretty sure I won't win (as I am not usually lucky), my e-mail address is baclancyATverizonDOTnet. Definitely would want the Knickerbocker Tee. It's so cute (and reminds me a lot of the baby baseball tee that you designed & that I'm thinking of knitting for the little guy growing in my tummy)! Honestly, I don't have a favorite baseball team. I'm from Indianapolis, and though we have the Indians, it's minor league & basketball is the HUGE sport there. My rav ID is BeanerShnump. As always, thanks for the review/giveaway! Definitely the Knickerbocker Tee, but I don't have a favorite baseball team because I, too, am from Indiana. I'm not sure most people here know baseball even exists! It's basketball, basketball, basketball. My rav ID is starcr. Ooh, I would pick the knickerbocker tee! I don't have a favorite baseball team, I like whichever team my nieces/nephews are playing for at that moment! Super cool! I grew up playing softball and now I watch my nephew play baseball. I would choose the Knickerbocker tee, I just love baseball tees. I would have to say that I am a Cincinnati Reds fan and a Chicago Cubs fan. And you can reach me through ravelry ID: pattymatt. The Knickerbocker Tee looks lovely! Another vote for Knickerbocker, although The Georgia Peach would be my second choice (I'm a sucker for a shawl collar). My first pick to knit would be the knickerbocker. I'm a FL gal so my favorite team is the Tampa Bay Rays. It's been fun seeing them gain their momentum in the sport. I love these patterns! My favorite is the Knickerbocker. I'm a Cubs fan by genetic inheritance. Sigh. Every one of these is a winner! What a neat idea for a book and so well executed in the bargain. 1. The Knickerbocker Tee for me as well. Three-quarter length baseball tees are my favorite t-shirt variety. 2. The Detriot Tigers. I'm not big into baseball, but my husband is. So, definitely the Tigers. 3. On Ravelry, I'm Amazonianb. I really like the Knickerbocker Tee and The Georgia Peach! I don't follow baseball, but my Dad does. Detroit Tigers. Whoops... I forgot to add I'm a Phillies fan, but we live in Maryland now, and I just can't say no to an O's game! Red Sox are my team. So hard to choose a favorite! But, I think I'll go with Georgia Peach. My hometown team is the Pittsburgh Pirates. I'd knit the Knickerbocker Tee, and my favorite team is the New York Yankees! I would knit the Trolley Dodger for sure! Being from New England, naturally I am a Red Sox fan. My fav team is the MN Twins. My fav pattern is the Georgia Peach. Baby Babe Ruth - I've got another nephew (or maybe a niece?!) on the way, hooray! and my brother-in-law is a Red Sox Fan, so he'd appreciate the baby outfit. I am partial to the Brewers, myself. I'd love to knit the Georgia peach! I don't really watch baseball but I'd support the Philadelphia Phillies.